The 2008 TopCoder® Open - Get ready for the Ultimate TopCoder Event! Who will emerge as champions in the world's most elite software developer face-off? The TCO returns to the action of Las Vegas for the TopCoder Open in 2008. Las Vegas has been kind to many TopCoder members: Jan_Kuipers, sindu, Mojito1, Petr and Pops, just to name a few. It's also where we crowned the first-ever Studio Design and Marathon Champions. Five new Champions will be crowned this time in Sin City. Will you be one of them? The 2008 TopCoder Open (TCO) is a world-wide programming tournament open to all TopCoder members who are 18 and older. There are four different competitions as part of the TCO: Algorithm Competition, Component Design and Development, Marathon Competition and Studio Design Competition. Becoming a TopCoder member is easy and free. Register here. Taking part in the 2008 TCO gives you the opportunity to showcase your programming or design skills up against some of the best in the world. We're also dishing out $260,000 in prizes. Have a question about the event or about being a TopCoder member? Just email service@topcoder.com. The TCO08 Finals will take place May 11 - 15, 2008 at the Mirage in Las Vegas, Nevada and we're giving away $260,000 in prizes. 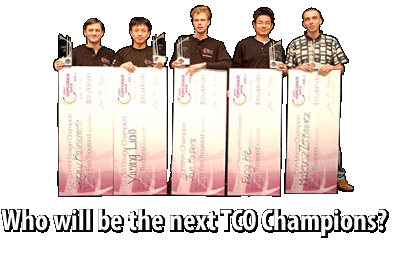 The TCO is bigger and better in 2008, as we increase the finalist pool by 50 percent! TopCoder will fly in the top 120 finalists this year to compete for more than a quarter of a million dollars in prizes. As our member community continues to grow, so does the elite competition. Spread the word, the world's best developers will be heading to Vegas in May! Only the top 120 competitors will make the TCO, so polish your skills now to prepare for the competition. We'll have room for everyone at the Developer Forums - start making plans now for your trip to Las Vegas in May. The competition is free and you must be a member 18 years old or older, as well as meet all eligibility criteria, in order to participate. It is important for you to read the official rules and regulations for the competition in which you are going to compete for more details.